We took the train from Rome to Florence and it only took, like, ½ an hour. We then stayed in Florence for two days before taking another train to Venice. Florence was such a beautiful city, we had so much fun, and I totally recommend it! Also, the two restaurants we ate at in Florence were definitely the best two restaurants we ate at in all of Italy. And one other thing, I didn’t love the hotel we stayed at so I’m not going to include it in this guide (positivity guys! ), so I’m using some other recommendations from friends about where to stay! Walking Shoes - I know this is already in my Rome travel guide but walking shoes are crucial when visiting Italy. They’ll be much more comfortable and keep you so much happier when your feet aren’t hurting within an hour. Crossbody Bag - A cute crossbody is a great idea when traveling abroad. You’ll be able to keep all your thing close to you and safe while still being able to use your hands and look around. Sunglasses - Sunglasses are essential when traveling to Florence. You’ll be doing a ton of walking and there are tons of outdoors cafes, so you definitely don’t want to be squinting (especially with all the amazing scenery!). Hotel Brunelleschi - This is a more modern hotel and is centrally located near all the big tourist attractions. I haven’t stayed here but I have friends who did and they say the hotel was amazing (many people specifically commented on how good the breakfast is). Hostel Gallo d’Oro - If you’re looking for a hostel, this one is supposed to be amazing. They have a super friendly staff and are really close to all the main attractions and big streets. Buca Mario - This is apparently one of the oldest restaurants in Florence, and no wonder it stayed in business for so long, it was amazing! It’s an underground restaurant with a super cool vibe and some of the best food in Florence. My mom claims the salmon is the best salmon she has ever had in her whole life. I had the tomato/mozzarella salad and asparagus (no surprise there) and it was delicious! Osteria del Cinghiale Bianco - This restaurant is another super old restaurant with a super good buzz. The food was to die for! My sister had spaghetti and it was amazing and I had (another) tomato/mozzarella salad that was also amazing! My one complaint, why is there no salt in the bread. I’m pretty sure it’s tuscan bread, but I don’t get it! Climb the Duomo and Bell Tower - If you’re up for walking up around 1000 stair, I definitely recommend climbin up to the top of the duomo and then up to the top of the Bell Tower. The view is amazing and you’ll definitely work off all those Italian carbs. lol. Visit the Uffizi - The Uffizi has an amazing collection of Italian artwork. It’s huge but still super interesting! Visit the Galleria dell’Accademia - Seeing the David is a must when in Florence. It was so interesting to walk through and see all the half finished sculptures and then boom, right there is the David. Window Shop - Right around the Duomo and the Uffizi are a ton of super high end shops. And while we all wish we could go in and buy everything, window shopping is definitely the more economically friendly option (and still really fun!). Visit the Leather Market - In Florence there are 2 different leather markets, both which are super cool to walk through. Even if you don’t buy anything it’s a really cool piece of Florence culture to see. 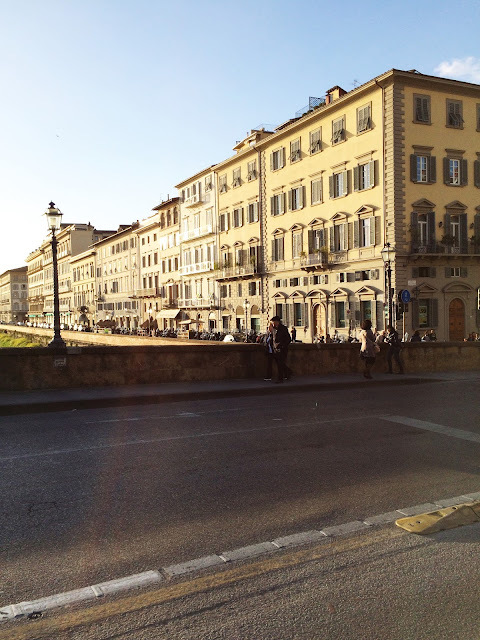 So, here’s my Florence travel guide. We had an amazing time and I totally recommend it. Comment anything else you recommend doing in the comments below to help out all our other fellow travellers!